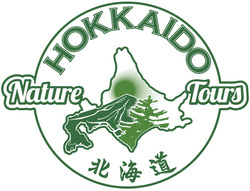 HNT Set Trips are geared especially for Hokkaido residents who enjoy the company of like-minded travelers and want to explore Hokkaido's great outdoors together. Check out our monthly calendar below to see the Set Trips schedule throughout the year. Early-booking discounts (10% off), member discounts (5% off) and group rates (15% off) are available, so contact us soon to sign-up for our next Set Trip. 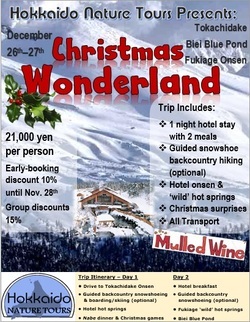 Overnight at Kamihoroso Onsen Hotel w/ 2 meals + Guided snowshoeing & backcountry + Fukiage 'wild' hot spring + Ningle Terrace handicrafts + All transportation RT Sapporo + Mulled wine! Be a hero: Reach the summit of a winter mountain! You will be guided on a snowshoe hike to Mt. Shioya Maruyama, a small but picturesque mountain on the outskirts of Otaru with a beautiful view of the Sea of Japan. 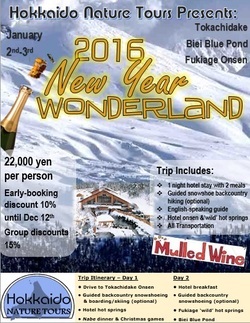 We will also visit a sake brewery (free entry), go to an onsen (entry included) and enjoy Otaru's atmospheric Snow Festival by the canal. 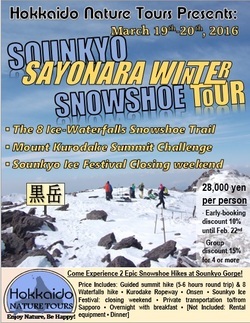 Come experience the grandeur of the Daisetsuzan mountains at the tail-end of winter. Two days of guided snowshoeing up Mt. Kurodake & along the 8 Ice-Waterfalls Trail will leave you speechless. 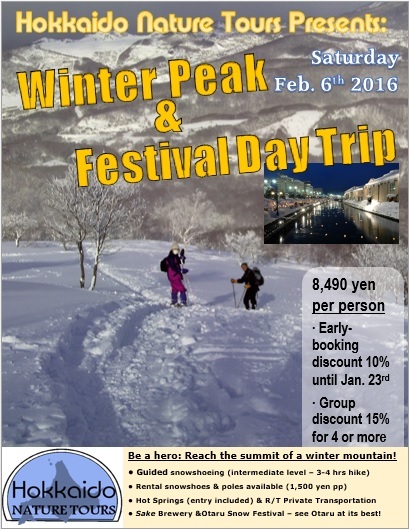 Onsens, Kurodake Ropeway, hotel accommodation with breakfast, Sounkyo Ice Festival & private transportation to/from Sapporo all included. An unforgettable way to wrap up the winter season! This awesome early-spring trip to the central mountains will reward participants with incredible views and a great weekend in the wilderness. Aside from hiking to the summit, we'll build an igloo together to practice survival skills, spend the night in a winterized hut, cook dinner together, and visit an onsen. Transport, mountain guiding, hut fees, breakfast & hot springs entry included. Snowshoes, poles, and sleeping mat & bag rentals available - inquire within. Hokkaido has the northernmost sakura (cherry blossom) viewing in Japan, which is in perfect timing with the best whitewater rafting of the year. Pink petals finally come into bloom just as the rivers swell from snow melt, allowing Hokkaido's usually tame rivers to surge into raging torrents. Add to that a unique bird watching cafe and fantastic hot springs and we're well on our way to a great day in nature. 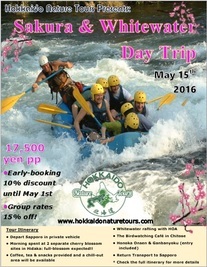 Transport, 2 sakura sites, whitewater rafting, coffee/tea/snacks & hot springs entry included. 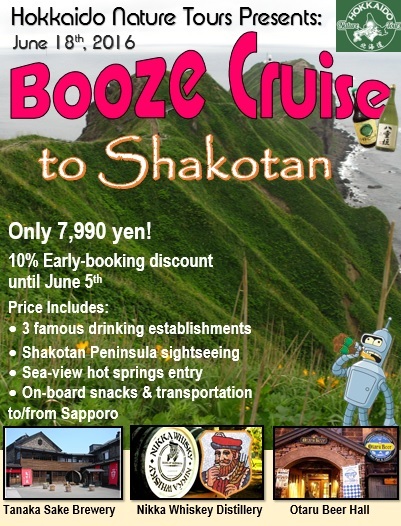 On this fun-filled day trip, we're going to three top drinking spots (Tanaka Sake Brewery, Nikka Whiskey Distillery, & Otaru Beer Hall), traversing the remarkable Shakotan Peninsula coastline for sightseeing and photography, and of course wouldn't miss the sea-view hot springs near the cape, all for the low price of: 7,990 yen per person! ﻿﻿﻿ There are no Set-Trips in July or August. Jump to September! A one day trip along the Sea of Japan coast, including a hike up the solitary and remote Kogane Yama, with a full beach BBQ at sunset and hot springs entry included. 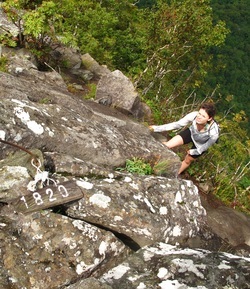 This trip is suitable for people of all hiking levels and abilities. 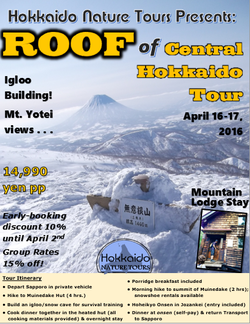 Come on a great adventure to eastern Hokkaido! We'll camp by two gorgeous lakes, hike an active volcano, bathe in resort & 'wild' hot springs, BBQ, go sightseeing and more. 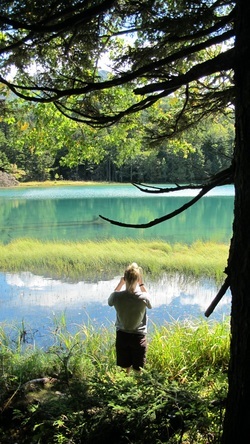 One of the best Set-Trips that will have you falling in love with eastern Hokkaido! Come experience the peak of fall colors on a wild Hokkaido mountain. Stay at a mountain lodge, soak in hot springs, visit a historical sake brewery, hike & BBQ. All meals, hot springs entry, transportation and lodge fees included! Join us for an awesome trip during the only long weekend in October. 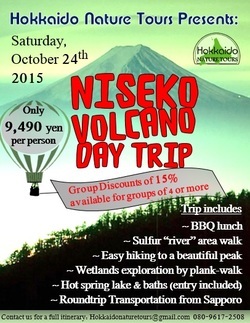 Join us on a trip to the Niseko region where we'll enjoy the best of Niseko's fall offerings! 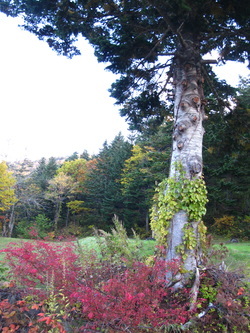 This may be the last weekend with foliage, so we'll head up into the mountains behind Hirafu to visit a revered fresh-water spring, explore a wetlands reserve. 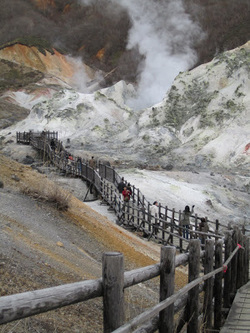 walk along a hot spring "river," and hike a small volcanic peak for great views of Mt Yotei. Lastly, we stop at a famous local onsen that adjoins one of the largest hot spring "lakes" in Hokkaido. Interested in Ainu culture? How about hot springs gone wild? Join us for the Hot Springs & Ainu Culture Day Trip to Shiraoi & Noboribetsu, where we will visit the excellent Ainu Village, hike around the dramatic Hell-Valley area of Noboribetsu, and bathe in one of the world's largest hot springs resorts. Make this Christmas unforgettable! Take part in a magical 2-day tour into the great snowy wilderness of Daisetsuzan National Park.